Empowering families to discover their true purpose for money. We are on a mission to transform the investing experience for all families, to empower families to discover their true purpose for their money, protect families from speculating with their future and allow families to recapture, reclaim or realize their American Dream. When it comes to investing, we believe in following three simple rules and avoiding three primary destructive investor behaviors. Meaning own stock in companies. See our presentation “Who wants to be a millionaire”? About half of the world capitalization is outside of the United States. Do you think it’s important to capture these global premiums? This means to keep a portfolio in alignment with what was agreed upon, the stocks vs. fixed income portions in the portfolio. Ask yourself, are you breaking any of these rules? If so, we invite you need to learn more about the SmartPlan Philosophy. Don’t wait another day to find out how the Really Smart Money Invests. Contact us today. SmartPlan’s Destructive Investor behaviors to avoid. Stock Picking, Fund Picking or even trying to pick the best preforming Asset Class from year to year does not work because markets are random. Diversification is a huge factor in reducing risk and maximizing returns. Simply owning a lot of Stock and Mutual Funds does not equal diversification. You need to own different Asset Classes that do not move in tandem. Often investors will try to get out of the market when it is down or when they think it is going down and get back in when it is going up or when they think they know the best time to get back in. Fact is, they need be right twice, getting out and getting back in. Statistics show that those who try to time the market versus staying put reduce the return on their money by simply breaking the #1 rule of investing - Buy Low, Sell High. By market timing they naturally do the opposite. Most investors can recall hearing this at the end of several investment commercials or remember reading it on a prospectus: “Past performance is not an indicator of future results.” Why would you think they are required to state this? Because it is true. You cannot predict future results by looking at the past performance of a stock, fund, or money manager. Modern Portfolio Theory, and the Three Factor Model. Learn more. Are market returns random and unpredictable? We believe that market returns are random and unpredictable. Two most recent examples are Brexit and the Trump election. There were market predictions that were forecasting a down turn and a possible crash. The reality is that did not happen. The image on the left; Randomness of Returns shows various asset classes: US Large Cap, US Large Cap Value, US Small Cap, US Small Cap Value, US Real Estate, International Large Cap Value, International Small Cap Value, Emerging Markets, and Fixed Income classes. 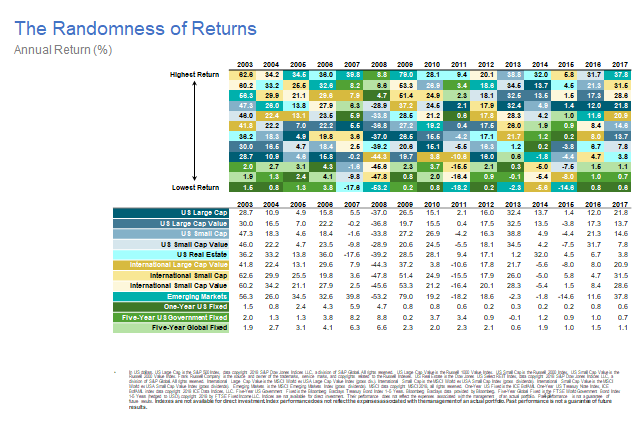 This image shows the returns of these various asset classes from 2003-2017. As you can see there is no pattern; meaning you can not accurately predict which asset class will be the best or worst performing from year to year, but the investing industry wants you to believe there are individuals that can. If there were someone, who knew where the markets were going, would they tell you? Since nobody knows what country, asset class, mutual fund, or stock will be the top performer from year to year, what is the solution? Free Market Financial Scientific Investing that captures market returns of various asset classes in the U.S. and Internationally, without predictions and other tactics that kill returns. See our globally diversified portfolios and learn about their different objectives.